Any size, everything is made to specific requirements. While certain sections and profiles have been used historically and are thus common, any section or profile can be incorporated, provided it meets the functional requirements. Thus any existing profile can be matched and incorporated to ensure the new joinery matches the old, exactly. Who is responsible for producing site measurements? If being made to a drawing, sufficiently detailed for the purpose, then the drawing will be followed implicitly, with only confirmation required from the installing builder as to the site sizes. If a site survey is required by us, as the provided information is insufficiently detailed to allow manufacture, then this will be carried out, for a small fee, once the order is placed. 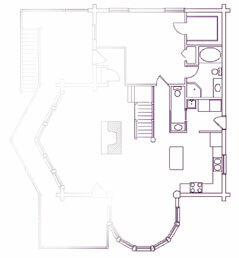 Send plans, or a sketch, to our address, either by post, fax or email if in an Auto-Cad format. Please include as much detail as is relevant, particularly if particular sections are required. A quotation form is available for download from the enquiries page to help you. Any timber can be specified, but only some are suitable for exterior joinery. While all timbers used are from renewable sources, only certain timbers suitable for exterior joinery are fully certified as such. This is more to do with the complexities of the certification process, rather than the ability to meet the requirements. Thus, at the moment, if full certification is required, the choice is limited to softwood or Oak. If certification is not required then the West African or other hardwoods can be used. Other manufacturers list available options in great detail. You do not. Is there a reason? Other manufacturers are usually producing large quantities via a production line. This limits them to the options they can provide although they will try to give as wide a choice as possible. We have no such constraints so any option which is feasible, is available. You just have to state your requirements.